It is the name given to a fungal infection of the skin. 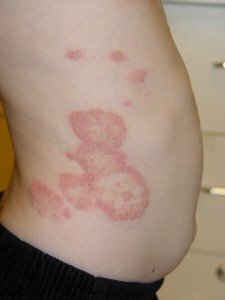 It is also known as a type of ringworm of the body that arises on almost any part of the body as a consequence of this infection. It is a common skin disease. It is also known as Tinea Glabrosa, Ringworm and Tinea Circinata. This disease is a result of infection by a type of small fungus referred to as Dermatophyte. These small organisms usually survive over the outer surface of the skin. When the conditions are suitable, they can give rise to an infection or rash. Recent fossil studies indicate that early humans may have contracted this ringworm infection due to sharing carrion (dead, rotten animal body) with dogs and wolves. Ringworm commonly affects pets like cats and dogs and a fungus can be adopted while grooming or domesticating the animal. This organism may also be taken over from other animals such as ferrets, pigs, cows and horses or by contact with inanimate objects like bed linen, personal care products, hair brushes or combs. Rashes usually arise as tiny, elevated red pimples and spots over the skin on face, arms, legs or other exposed region of the body. In the later stages, they gradually become ring-like in appearance with a red, elevated border and a clearer middle. The border may have a scaly appearance. There may be itchiness in the small round ring-shaped rashes. Individuals with extensive cases of this disorder may suffer from multiple rings. However, worms are absent in these rings. An infection by a type of fungi known as Dermatophytes prospers on the skin in such cases. 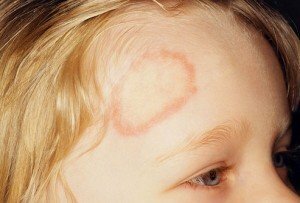 Ringworms of this condition may have different types of appearances. These are very easily recognizable by the enlarged, red elevated rings that have a middle section of healing. Similar appearances of this worm may also be seen on the beard area (Tinea Barbae), the groin (Tinea Cruris, known as dhobi itch or jock itch) or over the scalp (Tinea Capitis). They reside in humid conditions that are crowded. They sweat severely and the sweat produces a wet, humid environment in the body conducive to the survival and growth of the pathogenic fungi. This is especially common in the groin creases, armpits and the abdomen skin folds. They take part in close contact sports activities such as wrestling, rugby or soccer. They wear tight, narrow clothes that admit air very poorly. They suffer from a weakened immunity due to conditions like HIV Infection or intake of Immunosuppressants. Doctors usually examine the skin and take scrapings of the epidermis for microscopic examination. The external skin scraps are analyzed under the microscope which helps in quick detection of fungal presence. If fungal presence is suspected even after examination and the skin scrapings are negative, they may be sent for culture. The results of skin culture take a few days to show positive results due to slow growth of the fungus. Most cases of this disease are cured by topical application of antifungal creams over the infected areas of the skin. However, systemic treatment with the aid of oral medicines may be needed to cure extensive or difficult cases of infection. Ringworm usually shows an excellent response to topical cure. Doctors usually prescribe topical application of antifungal creams over the lesion for two times every day for a minimum of 3 weeks. The lesion usually goes away within 2 weeks. However, therapy should be carried on for one more week to make sure that there is complete removal of the fungus. Oral antifungal medications may be used if there are multiple ringworm lesions and the lesions are extensive. They can also be used if the immune system of the patient is compromised or if complications like Secondary Infection are present. Oral medications are prescribed to be taken once every day for a week. These can increase the rate of medical cure. Terbinafine and Itraconazole are two of the most common antifungal medications. Dermatophytosis is an infection of the skin that is caused by a type of fungi known as the Dermatophyte. Tinea Corporis is often referred to as a superficial Dermatophyte infection of the general skin surface in several parts of the skin including the scalp. It is actually a form of Dermatophytosis that mainly affects the legs, arms and the trunk. This is a highly contagious condition that can quickly spread from one person to another. In this case, the infectious agent may be transmitted through various means such as air, saliva, feces, blood, sexual contact and cough. The infection may also be spread from contact with infected animals as well as contaminated surfaces and animals. People who participate in contact sports are also highly susceptible to this condition. Many cases of this disorder are contracted from infected domesticated pets. This infection can also be contracted by a person if he or she lives or works in damp environment for a long time. Damp, moist surroundings are ideal places for fungi to thrive. Tight vests and undergarments that prevent escape of sweat can also lead to moist environment due to sweat accumulation. People who wear such tight-fitting clothes can also suffer from this condition. Here are some Tinea Corporis photos that you may use for reference. Check out these Tinea Corporis images to find out how the skin surface looks like when affected by this disorder. Both Tinea Corporis and Tinea Cruris are types of Dermatophytosis. Tinea Corporis is a Dermatophyte infection that affects the legs, trunk and the arms. Tinea Cruris is actually jock itch infection that affects the groin region. The area affected by Tinea Corporis is greater than the area impacted by Tinea Cruris. Tinea Corporis infection is completely curable. With proper treatment, it resolves within a short time and can leave no marks on the skin surface. If you suspect yourself to be having this disease, start immediate treatment to make a fast recovery. Hxbenefit.com - Recent Health Articles Copyright © 2019.